Designed for industrial and commercial use, GB’s hi-speed doors are ideal as an effective environmental barrier, reducing energy costs whilst providing excellent traffic throughput to cold stores, forklift truck access and other vehicle access points. Equally significant is the application to clean environments and food preparation areas where airborne contamination and rodent ingress can be kept to a minimum. When closed, the flexible hi speed roll-up door curtain provides an airtight seal on all 4 sides, providing a barrier against dust, dirt and contaminants. There is no gap between the side guides and the door curtain. The flexible bottom bag moulds, to seal off floor inconsistencies, while a top seal avoids extra energy loss at the top. 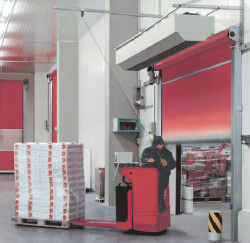 Hi Speed Doors utilized to control building temperatures and traffic flow in hi use door areas especially with Fork Truck activity. Activate to fully open at a rate of 1M/sec in normal conditions. Manufactured in all sizes to accommodate any opening and in any environment internally or externally. All access controls available and full consultation to maximise on your door system.